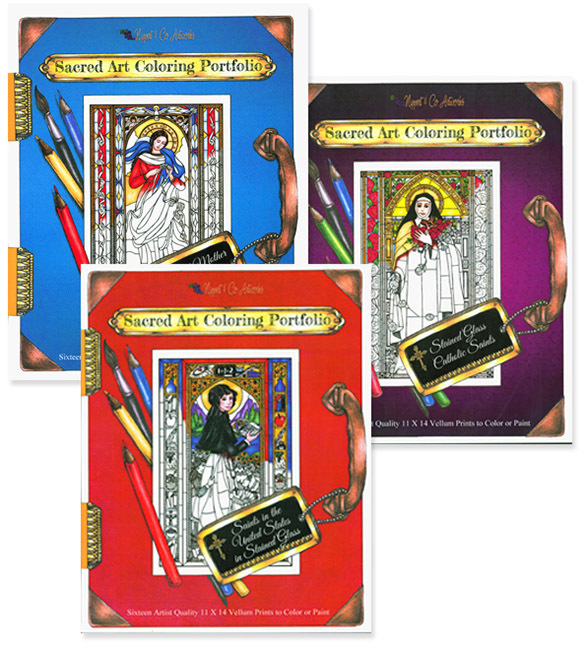 This Stained Glass Coloring Portfolio Collection for teens and adults will send you on a heart nurturing adventure of faith and creativity! This collection celebrates our Blessed Mother in her various titles and images; The thirteen Saints who have lived here in the United States; And, some of your favorite traditional Saints through Stained Glass images with artistic symbolism. Each of the three portfolios, measuring 11" x 14", includes 16 heavy artist quality vellum prints, a board, color guide and an abundance of helpful tips and tricks to help you achieve spectacular results! Each print has the inspiring story printed on the back, along with art notes to explain the symbolism in the image. Share the gift of coloring and prayer with your friends and family, as these make great gifts, or make a gift of your completed creations after praying for the recipient as you color in the images.